With the Eee PC 900 set to launch in the US in just a few weeks, it should come as no surprise that the 6-month old Asus Eee PC 701 is getting the refurb/discount treatment. If you’re in the market for an original refurbished 4G unit, you can pick one up from Amazon for as little as $341.29, which is almost $60 off the original price. 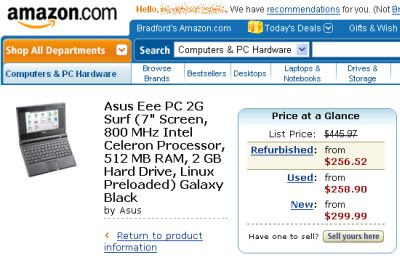 Amazon’s also got the 4G Surf for as low as $289.65, which is also about $60 off. The Surf is basically the same as the 4G, but lacks the webcam and has a lower capacity battery. The best deal I’ve found so far for a 2G Surf (which lacks a webcam, has a lower capacity battery, a slower processor and has half the storage of the 4G Surf) is $256.52 for the black model . But if you fish around on Amazon you can also find good deals on white, pink, and green versions. When Asus first announced the Eee PC, the company mentioned a $200 computer, which got a lot of people’s hopes up. It’s probable that Asus never meant it would sell a computer directly to consumers for that price, but rather that the company would try to make a $200 computer available for bulk purchase to governments and educators. But many people were disappointed when the Eee PC came to market with a $400 price tag. Now it’s finally possible for consumers pick one up for close to the price Asus originally announced. Is this really true about the battery? They both say ‘The 4-cell, 5200 mAh battery provides up to 3.5 hours of battery life (depending on usage).’ Is there more info on the differences between all these models than I’m seeing? If you check out the official specs from Asus, you’ll see that the 4G, 8G, and 900 all have batteries rated for 2.8 – 3.5 hours, while the 4G Surf and the 2G Surf have 2.8 hour batteries.